Welcome to the Chinese Embassy! I still recall my breakfast meeting with the Conservative Party China Group at the House of Parliament soon after my arrival in London last year. I’m very pleased to return your hospitality today. We will ring in the New Year in less than two months’ time. This gathering today is a good opportunity to review what we have achieved last year and look ahead to the New Year. I’m glad to say we do have much to celebrate. First, China-Britain relations have made new progress. This year has seen a strong momentum in our relations. This has led to the strengthening of our mutual understanding and cooperation in many areas. Premier Wen Jiabao, Vice Premier Li Keqiang, Vice Premier Wang Qishan and State Councilor Dai Bingguo all made visits to Britain, to hold our annual premiers’ meeting, the Economic and Financial Dialogue and the Strategic Dialogue among others. These high-level communications have served to expand our common understanding and narrow differences. A broad range of exchange mechanisms in other areas have also functioned effectively. We have agreed to create a high-level people-to-people dialogue. This will evolve into yet another pillar of our wide-ranging dialogue. We also added a macroeconomic policy dialogue within the framework of the Economic and Financial Dialogue. At the same time, our consultations on major global and regional issues are increasing. On many other fronts, we have also seen clear outcomes in our cooperation. Two-way trade continues to expand and reached 42.3 billion dollars in the first nine months this year, up by 18.3 percent year-on-year. British export to China over the same period jumped by 28.6 percent. China remains a major source of profit for British businesses, and Chinese investment in Britain is increasing and diversifying. According to British estimates, Chinese investment in Britain in the last fiscal year created twice as many jobs as the previous year. Both sides are making active efforts to explore cooperation in the areas of infrastructure, SMEs and intellectual property protection. Tomorrow the UK-China Infrastructure Investment Conference will be held in London. This is an important step to follow up on our leaders’ agreement on strengthening infrastructure cooperation. Our cultural, educational and scientific collaboration has produced new results. This has made Britain a leading partner for China in the EU in these areas. Second, we should celebrate the 2nd anniversary of the Conservative Party China Group. The Conservative Party made unique contributions to China-UK relations. Diplomatic ties between the two countries at the Chargé d'Affaires level were forged under Prime Minster Churchill and upgraded to full diplomatic relations during Edward Heath’s premiership. We cleared a major hurdle in our relations when the Joint Declaration on Hong Kong was signed when Mrs. Thatcher was Prime Minister. Since taking office, Prime Minister Cameron and his coalition government have called for closer China-Britain partnership. The Conservative Party China Group was set up on November 3, 2009. This was the first parliamentary group created by any major British party. It shows your party’s immense interest in China and China-UK relations. I hope you will give continued support to the coalition government’s China policy. And I look forward to your further contribution to a stronger China-UK relationship. Third, we should celebrate the success of your visit to China. I am glad to know that three of you, including Deputy Speaker Evans, visited Beijing, Shenzhen, Guizhou and Hong Kong last September. I was told you were particularly impressed by your trip to Guizhou. Perhaps this trip could go some way to showing you a real China. Yes, over 30 years of reform and opening-up have brought enormous progress in China in all areas. Yet China remains a developing country. There’s a huge regional gap in socio-economic development. We still have a long way to go to reach the living standards of Britain and other developed countries. More visits to places like Guizhou will help you to understand the challenges of development in my country. To closer inter-parliamentary exchanges between China and Britain. 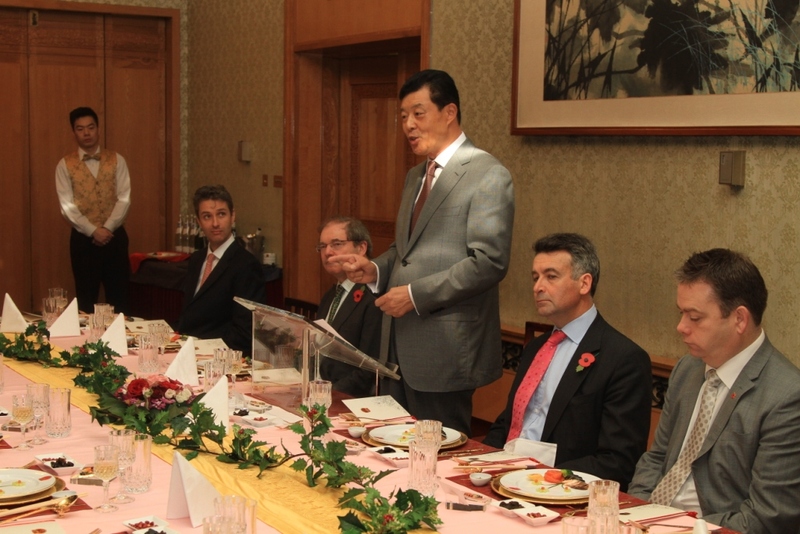 To ever greater contribution by the Conservative Party China Group to our relations in the New Year. And a healthy and prosperous New Year to you all!